"Enable / Disable a Combination, Import .csv" allows you to disable a combination and then reactivate it when you want without deleting any information. Save time with this module when a product combination is not available or out of stock. Once a declination is temporarily unavailable, most dealers like to hide a combination to avoid frustrating customers. Unfortunately, it is not possible to disable a Prestashop combination (it is necessary to eliminate it). When the combination is available again, you must then recreate it, which is quite time consuming, especially if the above is composed of several attributes, or require a weight or price impact. Our module allows you simply disable combinations (which makes attribute invisible to your customers), and also to enable it at any time and to resume sales ! - mass combinations management via .csv import. Enable combinations as quickly as you disabled it: our module allows you to see the summary of disabled combinations and enable them at any time; it is also possible to reactivate combinations directly via product page. 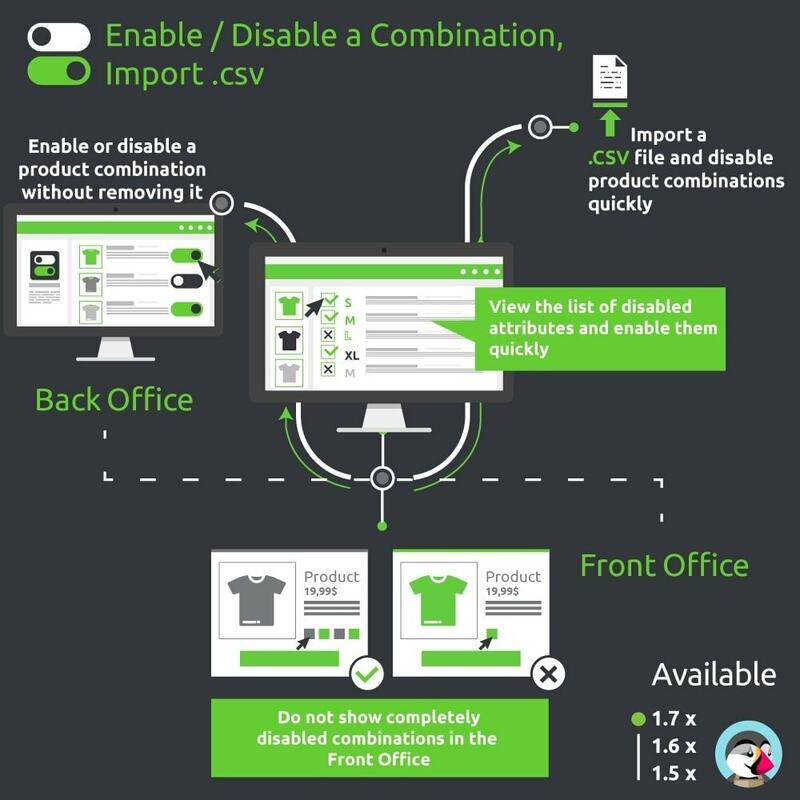 You can manage multiple products combinations: import .csv file for disabling or enabling products. Your .csv file can contain different informations, you should just associate your product identifier and quantity (or status) to columns names in your .csv before importing your products. When you want to reactivate some product combinations, simply return in the product list of variations, and click on the "activate" icon (you can also do it via product configurations page). Moreover, the module maintains a list of all disabled variations, each of these declinations are available for activation from the summary screen in module configurations. The module supports multistore & multilanguage. We suggest you the “Advanced Custom Fields : create new fields quickly” for creating your custom fields and to show them on Product, Category or Order pages in Back Office and Front Office. Now your customers will no longer have the frustration of seeing the version of a product marked in red "Out of stock". Instead, disabled attributes will not appear in the Front Office.